This entry was posted in Creations From My Craft Room and tagged bavarian crochet, bead work, charms, crochet, crochet throw, crystals, light-catchers, Orlando the Marmalade Cat, Siddy the Mitzu Dog, sun-catchers by thecontentedcrafter. Bookmark the permalink. How is it that I’ve missed commenting on your posts from the beginning of July, Pauline!!?? Yikes!! Be prepared to be comment-bombed (and please no pressure to answer – I just wanted you to know I’ve been thinking about you 😄). Now with my mea culpas out of the way, I’m loving your light catchers and the story behind their creation. What a lovely and special gift to give to someone! And your knitting and crocheting? Lovely as well. Many years ago, I used to cross stitch – mostly alphabet samplers (my decor tends toward early American). But now I don’t think my eyes could handle it, even if I had the time or inclination! Hi Pauline, I totally understand about life getting in the way of blogging, having been away for the best part of July I am now playing catch up with lots of reading and trying to get back into the swing of things. I hope you weather improves soon, it sounds awful. At least you have your lovely big blanket to keep you warm! I forgot to tell you, your pets are precious! I have several myself 🙂 I also realized I don’t know how to send anyone a photo on WordPress, ha ha, so this is the link to my facebook craft page…if you scroll down to the post that says “Into every room a little sunlight should fall…” and click on the photo, you can see my “boho” suncatchers. Thanks again for checking my blog out! LT the link hasn’t shown up here in the comment. I’ll try and track you down on facebook. That was probably my fault, did I mention the heat is gonna kill me? Ha ha. Willa’s Beads on Facebook. ..L.T. Garvin/Lana Broussard likewise on FB. Some of the beads on those are made of paper (laquered). Have a super Friday! I didn’t even get a chance to pine for your posts, because I’ve been *so* far behind! Talk about life getting in the way. Welcome back, my friend, in any case. Now I see you are dreaming of a beach house with a studio. That is what I will help you wish for, then. And that reminds me! In my new big house, with a whole extra bedroom, you have reminded me of what my plans were for that space. I can set up my sewing, my oils and sketches, and crochet, and finally have a place to store all the materials where they are easier to get to and no longer in a box in the garage somewhere beneath spider webs… I imagine that will make crafts much more likely to appear in my future. This winter may be brighter because of that. The studio has always been part of the dream Crystal – except now we’ve moved it to higher ground 🙂 It is wonderful to have a dedicated space for playing in – you will never regret setting it up to meet your needs! So looking forward to seeing pictures of your progress in settling! Thanks for taking the time to stop by and comment on so many posts – I’ve read them all and appreciate them so much! [That’s said just in case I don’t get to respond to them all]. hello Pauline…I feel remiss in not having checked your blog before now, especially since we tend to show up on sites we both follow! My only excuse is that I conserve energy and time for my own work, and sometimes that precludes expanding my garden of sites to follow and read. I am deeply interested in craft, though, and after browsing am quite impressed with the work you do. I have a studio space which sits idle because of moving and floods and discouragement. I used to do more, but life circumstances have contributed to my limiting things to my oldest and best loved, which is poetry…something I also regard as a craft, as well as an art. I very much admire the quality of your work, and will be stopping by again to have a look and a read! Hello Cynthia! Thank you for starting this ball rolling – I too have often noted your thoughtful and/or humorous comments on various blogs. I no longer have a dedicated studio space – it may or may not be temporary – I do have lots of flooding though 🙂 I shall stop by to read some poetry! Wow, Pauline, you have been missed and are loved! That photo of Siddy … what a face! Such a cutie. I love your crocheting, and your light catchers, and well, just everything. Hoping the winter will be less bitter soon, but if it remains challenging, I’m glad that peace reigns in your cozy, warm home. Welcome back! OBVIOUSLY you were missed! I can sure relate to life getting in the way of blogging – it can be SO rude sometimes!! 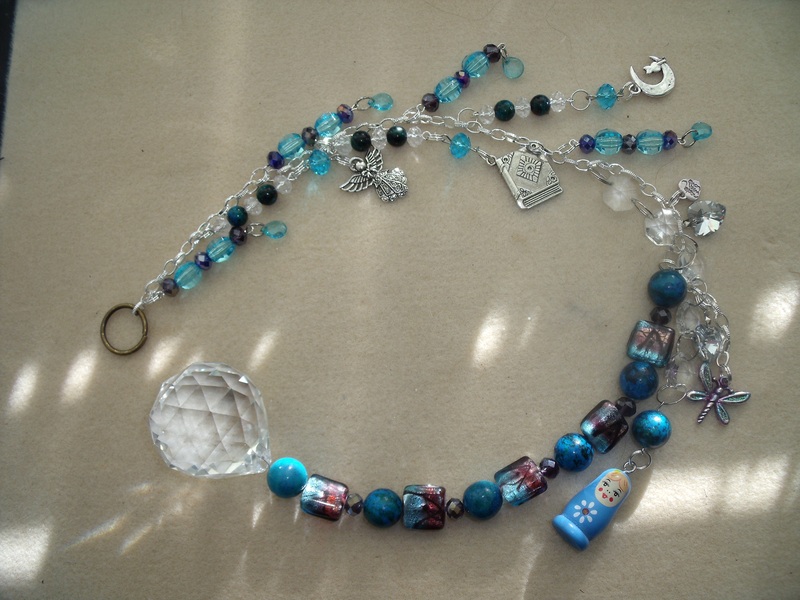 LOVE your suncatchers – I can just see the sun bringing them to life! Once again, you have evoked numerous exclamation points from me – if we ever meet in person you may be disappointed that I talk much less excitedly than I write! Oh – and your darlings are, indeed, darling! Now Shel, when we do meet up I shall indeed expect lots of exclamation points – I can imagine us both sitting there getting very excited and emphatic actually! Wouldn’t it be fun!! I had a shower this morning [yes, I did!!] and I finally remembered to use the coffee scrub – and OH MY!!!!!!!!! Not only did I emerge smelling like a freshly brewed latte, but I am soft and smooth as a baby’s bottom to boot!! What a gorgeous product – thank you so much for sending it to me! The sweets are eaten, the little jam pots almost emptied, the Oklahoma tray filled with a variety of threads and the pan-handle makes the perfectly shaped receptacle for the pins and needles holder ……… It all worked out rather splendidly 🙂 You are a doll! I want to send you a light catcher – that’s why I asked for your favourite colour. Do you still want to decline? !!!!!!!!!!!!!!!!! I’m SO glad you have found a use for all and the scrub is effective. I stand by my comment that no reciprocation is necessary – it was truly my pleasure to send you a smile. However – having said that, IF someone were to ask again my favorite colors, I would readily answer coral, green and yellow. And in case I’m being too subtle, I would absolutely LOVE a suncatcher!!! Wonderful post. So many lovely photos. I showed Your post to my wife and she enjoyed very much Your beadings. She has been beading long time. I remember seeing some photos of your wife’s bead work somewhere on your blog when I first visited – she makes beautiful bracelets! I am practising my bracelet making but have a long way to go! Thank you for visiting! Yours are gorgeous – sicerely! Welcome back! 🙂 Very very very good to see you here again, and I hope that life hasn’t been too challenging in its interference. By the way, please could we have some more photos of the Bavarian stitch throw? It looks absolutely stunning. Hugs to Siddy and a respectful, dignified nod to Orlando. Sorry to hear you have had such a harsh winter, it has been quite lovely here but I know down there has been awful and I hope at least you are managing to keep warm and cosy. The weather has not been kind to NZ this year has it?! You must have missed the post several months ago that did a giveaway of those mittens – ?? I’m just finishing off the last of twelve pairs that are winging their way round the globe to new owners. 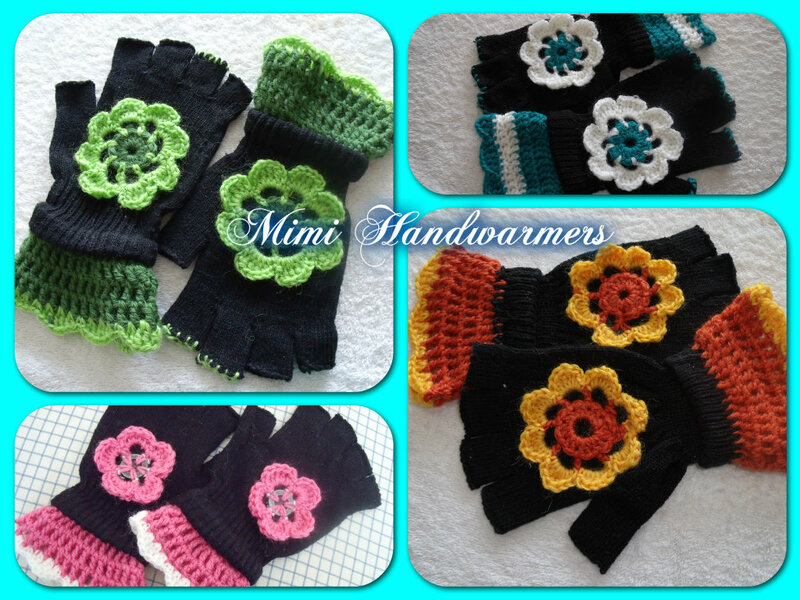 But yes, I am going to put both mittens and light catchers up on my new blog page for sale soon-ish……. I still have to get in touch with you about my idea……. Good to have you back! I love the sun catchers. Sorry to hear that winter is being awful to you – what is it this year? Crazy weather everywhere. We are having a cool summer, so far, had fires two nights last month, which is just not right! After the winter we had, we were hoping for a perfect summer. Still a couple of months to go, so maybe it will happen. Meanwhile, I hope your weather settles down and your dream cottage can become a reality. Thank you, it’s actually lovely to be back! Yesterday and today are more typical of our winter, frosty nights and cool, clear, sunny days – but we have had sleet, hail and thunderstorms [all at the same time] torrential downpours that resulted in the worst flooding ever seen, a sea that seems determined to claim back some land – on which a suburb is placed unfortunately – I just have to move the dream cottage inland further, it still remains a dream! Being used to a temperate climate this is all a bit of a shock. Apart from that life is a breeze 🙂 I hope your summer warms up! Moving the dream inland a bit could really work – if you could tell where to buy it now before it is seaside, you might be able to save some money! I love your posts. I love your words and photos. I truly hope we will meet in person one day. I am giving you something to take the pressure off. It was given to me a few years ago and I embraced it online and offline. here it is. a most special award.drum roll please. Woo Hoo! So nice to see your creativity again! That throw is really amazing–the perfect winter occupation. I’m so sorry to hear all the disastrous weather and washout stories. It’s a scary and unpredictable situation. I like the picture of Siddy and Orlando. I did not know of their rivalry, having come to your blog only last winter. Glad they’re snuggling up finally. Like Lord David, I like the turquoise piece as well. Something so lovely about that color–it’s got earth and water and sky and when you throw the light in, it’s its own world. Welcome back. Don’t rush the next post. We’ll be ready when you are!! I feel it’s been ages since we caught up Fran! I’m not on social media at all these days [except to play a couple of games with my playing opponents 🙂 ] And our blogging is highly irregular too! Miss you!! We have -5 C frosty nights and rain, hail, sleet and/or snow which of course = black ice. Which we all know keeps the vehicle panel beaters happy but not too many other people. Siddy has been living here for over a year now and has gotten very big [around as well as high] and is a grown up boy now. Time sure has flown by! I am thinking of abandoning Facebook as it keeps sucking my time. I have a LOT to accomplish this year and I want my time spent online to matter when I get here so I am phasing out time wasters like FB and focussing on the programs etc. that do matter and that I really care about. I will be spending more time blogging soon but at the moment I am snowed under with the “learnings” that my poor aching noggin’ has to stuff into itself on a regular basis. I am spending my holidays playing catch-up as I point blank REFUSE to fall behind. The rest of the class seem to find this all so easy (including Stevie-boy). I think my brain is wired differently to the rest of them! I created an arched conservatory window today with frosted glass and art deco panels. I am happy now :). Well congratulations on the arched conservatory window – that sounds like hard work to me! As a creative ‘big picture thinker’ I wonder if you are like me and are maybe / probably challenged by the step by step processes involved in techie work. Creative big picture thinkers get inspired by seeing something, somewhere and taking it off in their own particular direction. They often jump about subjects in conversation, arrive at the end before any body else and add in lots of other interesting tid-bits along the way. They get bored easily, lose themselves totally in really creative projects and having mastered one skill move on to the next. Their one small draw back is that they can flit like butterflies from one project to another, pick up a skill but not necessarily truly master it before moving on to the next attractive idea……. Sound like anyone you know? I think I might be the opposite actually Ms Pauline. I love the step by step stuff. When we were working on tutorials at the beginning of the course I was shining like a star. I thought the 3D world was my oyster and I was having fun using the program but then we had to riff on a theme and just “come up” with things from (the admittedly small pool of experience) what we had been doing so far and I hit a brick wall. Seems I am good at following a tutorial but not so good at pulling 3D creative genius out of myself on call. Stevie-boy is making the most magnificent creation. I am in awe of his ability to just get in there and “do” it. I have been phaffing around trying to nibble at the outside of my project and all I have is a narf-nibbled enormous nugget of a conundrum to show for it. It’s not like I don’t know how to use the basics of the program, it’s just that it’s not like picking up a crochet hook and riffing, its more like wrangling a technological tiger for me and I keep coming up against things that I have to head off and research online for hours on end. Example. I was working on my window (that almost took me an entire day by the way!) and had to work out how to join to “points”. Just a simple line between 2 points but you can’t actually do that in this program! The next hour was spent trying to work out how to join 2 dots with a line and in the end I just started looking for specifics on the program that “might” do it. In the end I spotted the word “bridge” and thought “bugger it, I am going to give it a burl!” Bridge WORKED! I am now greyer but wiser. I guess it is all a steep learning curve and the problem with me is that I am working blind. I am not naturally au faire with technology (still can’t use the TV remote 😉 ) and we are very strange bedfellows. I am chuffed out of my mind that I made a lovely arched window with frosted glass that you can see through. Now I need to create a trio of them in different sizes for the front of the conservatory and some doors, a building (not hard) and then a lot more. I guess it is the process of finding out how to do it all, the stopping and starting constantly to go and look things up on Youtube and the fact that if you don’t word your query exactly right (especially with this technological bampf…”the doohicky won’t work!” doesn’t come up with much that helps 😉 ) you are behind the 8 ball and running blind. I don’t do “out of control” well. Stevie-boy thrives on it ;). You just described Steve perfectly in your explanation. I am a processes girl. I like to start at the beginning, move through the processes step by step and arrive at the end and “VOILA!” I love patterns. I don’t love freestyling. Well then, there we have it! My conundrum now is that I am exactly like your Stevie-boy, not a whit like you [following processes logically is NOT my forte!] and yet can’t fathom how computer programmes work for the life of me. I think that must be a third type!! Hi Pauline:-) So glad you are back so we can play catch-up on what you are doing across the waters. It looks like you have been busy! Always love your art and your sun catchers are lovely. I was wondering where you were this past month???? Now I know + am so glad to hear you were just busy with life. You should be warming up since we are past July 4th..our days are getting shorter!!!! Gasp! Looking at all your beautiful projects and Siddy and Orlando snuggling happily together, it’s no wonder at all why you would have time away. Your life looks artful, peaceful and full of love. A beautiful thing indeed and in itself, enough to sustain us. Just reading thru your messages, it’s obvious we’re all enjoying life too. Good friends are never too far away, and don’t need to keep a schedule it seems. I’ve been lucky to find this true in my own little corner of WP. When I spotted the purple sun catcher, I immediately guessed who it might be for. Sharon will be so happy. I envy her and Alys to have the sister love and friendship they share. I think of you girls as one might a sister. At least in my heart I do, having never had a sister I really can’t ‘know’ what that bond would feel like. Unbreakable, I would think. Your Bavarian has grown to an impressive shape and size. My gosh that must have been a challenge to maneuver toward the end. Yesterday I received a lovely hand made card from Sharon, so I thought [assumed] you had already given it to her, which is why I went ahead and posted those photos. I hope she doesn’t read my blog! 🙂 I’ve also read and not yet responded to your email – will get to that later today! xoxo Thank you for your so kind and generous words again Alys, you are a treasure to me! Sorry for the confusion, Pauline. Sharon received it with great fan fare (meaning I took video!!!) and it has been on my long list of things to blog about. The reason it is back with me is that she’s asked me to to hang it for her, something she’s not able to do on her own and also so I could take photos. Does that all make sense? Pauline, what a warm reception you’ve had here. I’m delighting in all the wonderful comments, above, as much as I’ve delighted in your post. I read it just before bead last night, but new I was too tired to leave a proper reply. Now you are slumbering and hopefully staying warm and dry with the adorable Sid and Orlando nearby. I will look forward to Danella’s photos when she posts. I’m going to look for some news footage of your crazy winter weather and beach washouts. It seems these global weather extremes continue unabated. It’s hard to grasp its enormity. It has dawned a lovely sunny day Alys – it must have heard my grumbles! 🙂 Here is a link that shows a bit of news from a couple of weeks back. If you watch to the end you will see Danella’s often photographed beach poles in a new circumstance. We are no longer able to access that particular beach. I’m so happy to hear about the sunshine, Pauline. Thanks for sharing the link. Those workers must be miserable trying to complete there work while be hit over and over again by cold waves. I’m surprised they don’t wear a harness to keep from falling or being knocked over by a wave. How sad to see your beach under duress. Pauline, you have your sense of humour in tact, but my gosh this sounds perilous. Sink holes! Washed away steps! No access! Is there an end in sight. You made me giggle at the machismo of your ‘kiwi blokes.’ It must be alive and well in most men. Pauline it is so good to hear from you again. As always your art is beautiful. The picture of Siddy and Orlando cuddling is precious. Sorry the winter season is not treating you well. I am not surprised at the ocean making forays into areas where it is not normally seen. We have that problem here too, and all it takes is a high tide. Yes, things have changed and continue to change with climate. Yes indeed, it is a new world we are living in – as you say, change has happened and will continue – we must adapt where we can and learn new skills too. Oh, Pauline! You were on my mind I was thinking to send you an email this weekend as I have been wondering and worrying about where you have been. So glad to see you back. It looks like you have kept yourself busy. as usual, your crochet project is absolutely gorgeous!! The light catchers are inspiring and although I do not have the talent you have I am most certain. I have three sisters with birthdays coming up in a few months and it made me think I might like to give them a try. I think they would make a perfect gift. Any tips you might care to share? Good to see Siddy again. Sorry to hear about your weather. I have not done such a great job keeping up with the blogging either. Big hugs to you. I look forward to seeing some of your artwork soon. (as if you have not been busy enough) Have you been painting too? Thank you Jan – I appreciate the care! Now you make me think I should do a post on how I make a catcher – that should guide you on the way and be fun for me to do also. [I am in the process of putting up a page with a few items for sale too and intend to pop a couple on there.] I haven’t been painting and am itching to get back into it! That would be great if you offered some guidance or a tutorial on those beautiful items. We hold an annual sister’s birthday party and this year it will not be until early September so I have some time. Will you be selling your items on Etsy? I have thought of trying to set up a site to sell, in fact have an Etsy site and I have never done anything with it. Keep us posted. I have an Etsy shop Jan, but closed it down as it is almost impossible to get traffic other than people who come via my blog or friends and family. So I am intending to open a page on this blog that lists what is available, including postcards and original paintings and prints and light catchers ……….. Then anyone who wants to have something can, without the cost of Etsy being added 🙂 I’m already thinking about how to do a tutorial. I will be interested in seeing how that works out as that was another avenue I had wondered about! It’s great to see you back, Pauline! I’m sorry about your winter. I trust that your weather will improve quickly. I do know that although your winter is rough, it is spring in your heart and home. Your sun catchers are beautiful. I’ll have to try making one some day soon. I don’t know anything about Bavarian stitch throw or blocking; what I do know is that the one you’re making is beautiful! One day, some day, in the near or far off future, I’ll surprise myself and learn to crochet and make something purposeful 🙂 Siddy and Orlando look so cute together! Thank you Sharon! And thanks for sticking it out – I must pop by your place now I’m back in the swing of things! Hi Kym, it’s been a while since we caught up hasn’t it! The light catchers look so much prettier hanging, static lying about really doesn’t suit them at all! How’s your winter going? We’ve just had -10 and -11 frosts. I don’t think I’ve had anything like this here in my lifetime! I’m really glad not to have to go out in it first thing in the morning any more. 🙂 good luck when you have to go back to work! Dear Pauline, so lovely to see a post from you again with so much beauty. Are you disappointed to have to let go of your dream cottage and do you miss painting? Your Bavarian is so beautiful, love the colors. Do you have space to block it? I just knitting a large shawl and I am blocking it on the mattras of the spare room bed! The mittens are charming and cheerful. And I can very well see how lovely the sun catchers are! I love the story of how you make them with a little magic woven into it. Thank you Johanna! The seaside cottage was always just a dream – but yes, it is sad to realise it not only isn’t viable but also no longer sensible 🙂 Maybe that is why it has never eventuated! Yes, I think the blanket will be blocked over a bed – but we will wait for warmer days to do that. It sounds like you’ve had some disruption in your life! And, yet, you’re still be very creative–that throw is so impressive, in size and beauty! And I would think the light catchers are soothing to make. 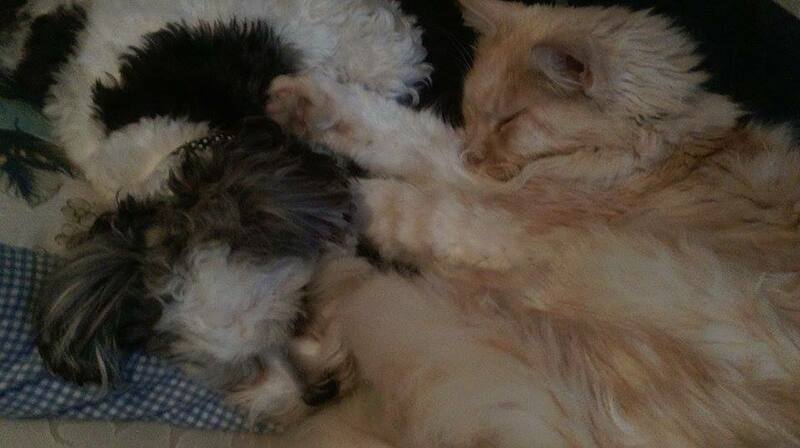 The dog and cat sleeping together–that’s truly amazing–when I think back to the photos of Orlando, looking peevish, I can’t believe how far they’ve come! Wasn’t he the picture of disbelieving disgust when puppy first appeared 😀 Now the snuggle and snuffle and wash each others ears – it’s all a great treat to observe! Lovely Bavarian crochet… I have some on the go, but it’s a bit too warm here to spend time draped in wool and it’s big enough now that I have to be underneath part of it whilst I’m working. It is a perfect winter activity. Yours looks fabulous – I hope you have space to block it! 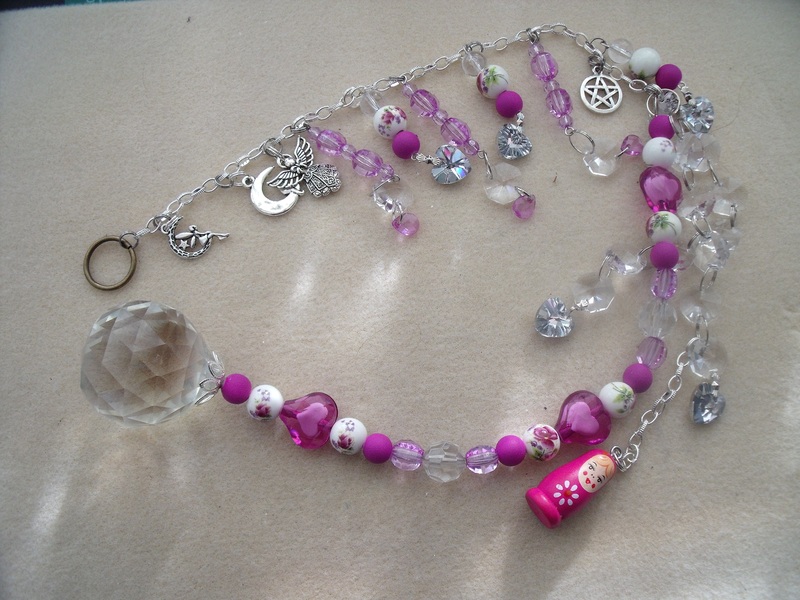 I love the light-catchers and as I am currently doing a lot of sorting through stuff, I may make one or two from the beads and bits of broken jewellery I keep coming across… likely to be more random than yours, but good for decorating the limery! You may not have done much writing recently, but I think of you every day as I gaze at ‘grow where you are planted’. The light catchers are beautiful, even lying down. That turquoise is stunning. I’m sorry the idea of a cottage by the sea there is having to be shelved but I hope you can come up with a viable alternative plan to keep the dream alive. Me too – it’s partly why I enjoy your garden so much you know! Welcome back Pauline, although you haven’t really been away. Love those light catchers. The Bavarian Stitch throw is a masterpiece. And 6 balls in the final round is astronomical. No wonder Otago had floods. Bruce, I’m up to chapter 30 – I am reading every chance I get- it is wonderful and made doubly so by the fact we are the same age and so grew up in the same era and I know almost all the towns and places you write about. Delighted that you’re enjoying it Pauline. I’m starting to feel like JK Rowling! I love the photo of kitty and puppy curled up together. 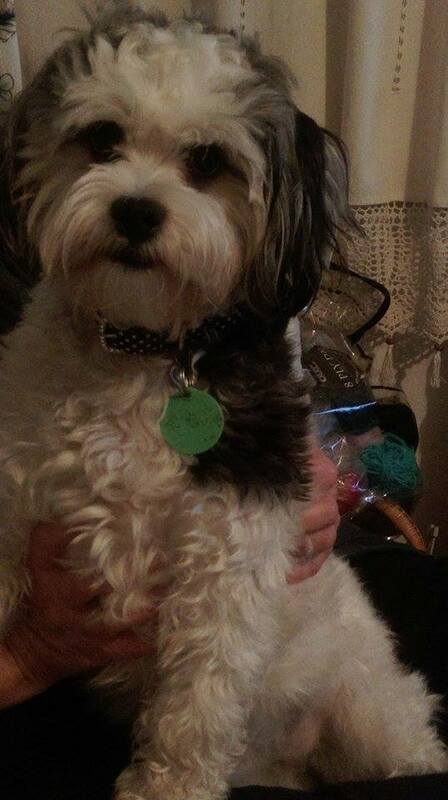 You are lucky that peace reigns in the pet realm but so sad about flooding and changes in plans for your house dreams. 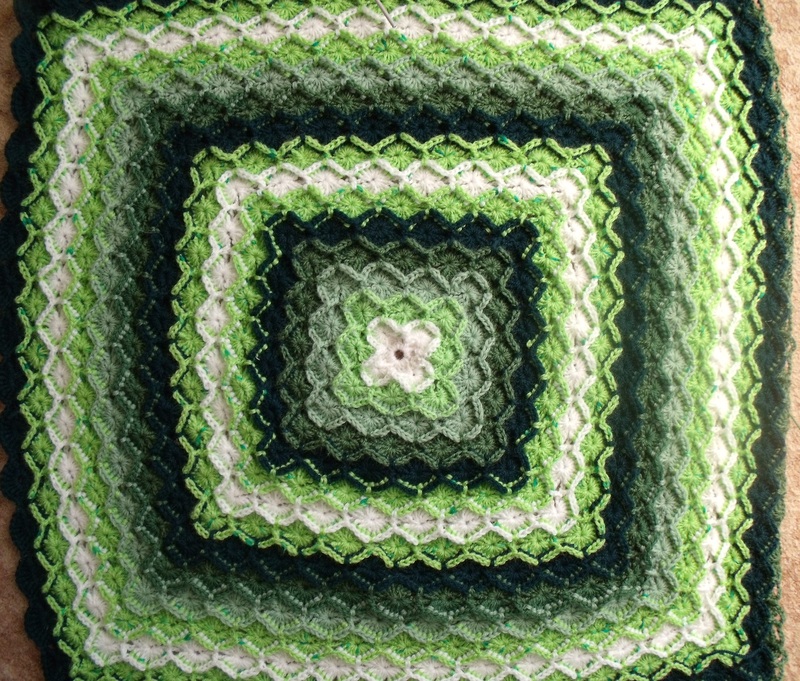 Your green, large and beautifully designed Bavarian stitch crochet throw is gorgeous. Your pretty mittens and sparkly light catchers will certainly be treasured by their recipients. Wishing you some solutions for your living decisions, Pauline. Your “gentle nudge” was more like my way of showing you I had you on mind, Pauline. I loved seeing you here again. I really do like your large and gorgeous green crocheted coverlet, Pauline. I can picture you and the 2 little “snook-ums” or “sweet-ums” curled up in it on a bed piled with pillows while you read and sip tea or cocoa. The magic which you weave into your light catchers has worked its way into the lives of Siddy and Orlando. Such a darling photo. I am so delighted to see you, Pauline!! I so understand about life getting in the way. But life is why we are here, to live it, not just to write about it. So the writing will come in its time. I’ve had the same struggles. I had not heard of the weather you are having. Not sure where to find out about it. I too love the sea but the sea is taking back land too quickly with all the melting. There is flooding in some parts, drought here where we always had an abundance of water. Everything is changing and we have to be willing to make the adjustments. I hope there wasn’t a job loss or something more serious going on. But I am truly delighted to see your furry family snuggling. It was bound to happen with time. Hugs.